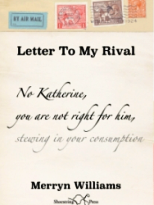 The poems in Letter to my Rival are largely focussed upon people. We eavesdrop on conversations and correspondence as well as private thoughts and memories. Sometimes we are given a perceptive commentary on a whole life or a major incident within it. All of this – at least from the point of view of this reader – is a Good Thing since I find human relationships, imaginings and misunderstandings to be fruitful ground for poems to spring from. It is perhaps revealing that I have just drawn upon a cliché from Sellar & Yeatman’s classic 1066 And All That because their division of the whole of British history into Good and Bad Things has a kind of clarity which is shared by Williams’ poetry. This is not, of course, to say that her poems are naive or simplistic; but they do have a directness and accessibility which, for the most part, make the reader feel included. who snaps at your heels. Rivalry of another kind occurs in the particularly effective poem ‘A.N.Other’ in which a moderately successful actor (but some people said I was good) is doing a piece to camera as part of a televised tribute to a major theatrical star. Williams cleverly lets resentment ooze from beneath the surface of joking recollections of being young hopefuls together: We went out drinking quite a lot, and I’ve seen him under circumstances – / but invariably he pulled himself together before the curtain. And after token agreement about a tragic loss to the British theatre comes a judicious drip of vitriol but I wonder if, in another ten years, he’ll be quite so –. That note of envy in the presence of celebrity occurs again, somewhat nearer to home, in ‘At the Literary Festival’ where, when invited to share a platform with a famous writer, you’re far too busy chatting up the great man … whose name is blazoned in red letters and ambition urges you to lick his spittle, sip your Chardonnay; his audience yours for a fraction of a day. in record books. She was the very first. We cheered her, but it ended in disgrace. ... you can’t know, and you keep on wondering. the picture ages underneath your eyes. These poems have a ring of truth. Other, darker, pieces may be fictional but have the vividness of well-shot film. A betrayed woman still in her flimsy dress … drives wildly through a black unknown landscape. Another woman worries about possible violence in her friend’s marriage: I asked her to stay the night… But she went and a few hours later is in hospital. All I know is, she was all right when she left me. footprint than ours? The babes all look the same. Perhaps these last few comments are minor quibbles about an otherwise very enjoyable collection. As can be seen in the quoted extracts, Williams makes a lot of use of rhyme and form and does so skilfully but with a light touch. She also gives us three entertaining versions of poems by Horace and a couple of translations from the French of Baudelaire and Louis Aragon. At just 49 pages, this collection is not a long one: but it is not short of variety.